Chic Burlingame was a boy of 6, living with his family in England, when he found some pieces of lumber in the alley behind their home and fashioned them into a plane. Despite his age, he already had dreams of flying -- and he would realize them eventually, attending the U.S. Naval Academy in Annapolis, landing F-4 Phantom jets on aircraft carriers as a Navy pilot, and flying as a pilot for American Airlines. On a beautiful morning two years ago, Charles "Chic" Burlingame III was the pilot of American Airlines Flight 77 when it was hijacked and flown into the Pentagon. The crash killed 125 people at the Pentagon and all 59 passengers and crew members on the flight, including Burlingame, 51, a resident of Fairfax County. On the second anniversary of the attack, Burlingame's brothers and sister launched a nonprofit foundation that will provide college scholarships for young men and women who wish to pursue careers as officers in the U.S. armed services. "We are targeting young people who have demonstrated a wish to be a part of something bigger than themselves," said Debra Burlingame, his sister. At the heart of the genesis of the foundation is a photograph taken by Chic Burlingame's mother that day in England in 1955 when the boy surprised his parents by presenting them with the plane he had built. The photograph shows a young boy shyly holding up a plane bigger than he is. On the wings, the boy has written the letters "U.S.A."
"What really gets me about this picture, apart from the fact it's my brother with his whole life ahead of him, is that it represents the innocent dreams and aspirations of a child," said Debra Burlingame, who came to Washington recently with her brothers, Brad and Mark, to promote the foundation and attend Sept. 11 remembrance services, including a ceremony at Burlingame's grave in Arlington National Cemetery. The photograph was among those on display at a memorial service for Burlingame at Annapolis after the attack. Soon afterward, a friend who was at the service suggested having the picture made into a life-size sculpture. Pursuing the idea, Debra Burlingame contacted Ron Petitt, a Colorado artist and Vietnam veteran who specializes in sculpting military figures. Petitt has created a model for the planned sculpture, and the family plans to raise funds for the foundation by selling bronze sculptures to the public. The Burlingame siblings have created a Web site, www.patriotdreamsfoundation.org, with information about the organization. The foundation's goals are something Chic Burlingame would have embraced, according to his sister. "We feel that there are many talented, bright kids who would make terrific officers and that they should not be denied their dream simply because they come from families with modest incomes or attended secondary schools that didn't adequately prepare them for standardized testing," Debra Burlingame said. ANAHEIM, CALIFORNIA -- Opening Day. So democratic -- today, every team still has a chance. So emblematic -- spring is hopeful no matter how long the winter has been. No matter how deep the loss. No matter how much we miss that one person who used to live for trips to the ballpark. He wasn't here Sunday night for a California family when Major League Baseball opened the 2002 season with a nationally televised game. He wasn't and yet he was. Americans know him as the pilot of American Airlines Flight 77, the jetliner that slammed into the Pentagon on Sept. 11 after being hijacked by terrorists. His family knew him as "Chic" (pronounced Chick), a brother and a friend who was gregarious and eager, disciplined enough to graduate from the U.S. Naval Academy and yet crazy enough about baseball to do things that still make his loved ones smile. The Burlingames were smiling Sunday as they gathered for the first time since Dec. 12, when Chic was buried at Arlington National Cemetery. They were smiling because they were together at Edison Field for a tribute to Chic. Chic had virtually grown up at Edison Field, so the Angels were honoring his memory by arranging for U.S. Navy SEALs to parachute into the ballpark and deliver the baseball that would open this new season. That ball was handed to Burlingame's brother Brad, who stood on the mound and looked skyward as eight SEALs dropped one by one onto the lush, green grass of center field. Brad took the ball as if it were a "diamond," he would say later. And then threw out the first pitch. That's how this season began. L:et's hope it's a good omen. Big-league baseball could use it. And those who run baseball could use the reminder that baseball is, above all, a sport where families gather and a game that marks the years through memories and moments at the ballpark. Since Sept. 11, we've all been reminded of how precious life is, of how much our country and our families mean to us. More than most, the Burlingames know this. They've spent the past six months grieving as families do when suffering a tragic loss. Add to their grief the magnitude of what our country has gone through since 9/11, and you have a winter that has been a blur of emotions. So when the Angels called and invited them to the park to open the season, the Burlingames and their friends -- many of whom live on the East Coast -- made the cross-country trip because they knew Chic would appreciate it. He was a baseball fan to the bone. And he was a lot more. His family is certain that hijackers killed Chic on 9/11 before his plane crashed into the Pentagon, that there is no way he would have crashed the plane himself into that building -- even with knives at his throat. "The Pentagon was hallowed ground to him," Brad said. That's because Chic was a Navy man who had once worked at the Pentagon when he was in the Navy Reserves. Arranging for Chic to be buried at Arlington National Cemetery was one important step in the family's healing process. Being at the ballpark Sunday was another. Chic and his brothers had seen years of frightful Angels baseball in the 1960s -- and yet their love for their team never wavered. In fact, in 1986, when the lowly Angels were one game away from reaching their first World Series, Chic dropped almost $1,000 for two tickets to see his "Halos" against the Boston Red Sox. He took Brad with him. They had great seats. It was an epic game. The Angels came within one pitch of baseball's promised land ... and they lost. It didn't matter. Though his work and family took him to the East Coast, Chic Burlingame -- a California guy, at heart -- stuck with his team. When he died on 9/11, a day before his 52nd birthday, he had been planning to go to an Angels game. Sunday, Chic's image was flashed on the big screen at Edison Field as a capacity crowd rose to its feet. It was a special moment for baseball and for a family. "This was more than just a reunion for us," Brad said. "It was like a homecoming." It was also a great way to start the season. Charles F. "Chic" Burlingame III, pilot of American Airlines Flight 77, was buried at Arlington National Cemetery yesterday and eulogized as an American patriot who inspired those who served and worked with him. Burlingame, a former Navy fighter pilot, was honored with his own grave at Arlington only after his family, members of Congress and veterans campaigned to persuade the Army to waive cemetery rules to make it happen. Until Friday, the Army said Burlingame would have to share a grave and headstone at Arlington with his parents. Yesterday, more than 200 mourners -- including friends from American Airlines and the Navy -- gathered at Burlingame's grave, where a Navy band filled the chilly air with "America the Beautiful" and a bugler played a soft, slow taps. "I'm very pleased and grateful that Chic was honored in this way," Sheri Burlingame, his widow, said afterward. "It was a beautiful service, and I'm thankful to everyone who made it possible." The push to make yesterday's ceremony a reality gathered momentum after Sen. John W. Warner (R-Va.) and others cited evidence that Burlingame died fighting the hijackers before Flight 77 crashed into the Pentagon on September 11 -- an image of heroism touched on by those who eulogized him yesterday. At the service, Senator George Allen (R-Va.) said Burlingame "gave his last breath in the struggle against terrorism," calling him "a true American patriot who paid the ultimate sacrifice as one of our nation's first warriors to perish in the war on terrorism." Others described an intelligent, generous and lighthearted man known for his imitations of Frank Sinatra and "Saturday Night Live" skits. After graduating from the Naval Academy, he served eight years in the Navy, flying F-4 Phantom fighters. He was a reservist for 17 years and served in the Persian Gulf War. The Herndon resident died one day before his 52nd birthday. "To the forces of evil that took his life, I say this to you: We are a nation of Chic Burlingames, and you can never impose your will on us," said Capt. Barton W. Whitman, a Navy Reservist and friend of the pilot. "You have taken this man from us, but his spirit is in tens of millions of Americans. . . . There is no cave deep enough, or ocean wide enough, or jungle dense enough to hide from our wrath for what you have done." Until last week, Secretary of the Army Thomas E. White had said Burlingame would not get his own grave because of his age. Rules at the cemetery -- which is run by the Army -- require that reservists be 60 or older to be eligible for their own plot. After discussions with the White House and Defense Secretary Donald H. Rumsfeld, White said Friday that he would relent and grant an exception for Burlingame. The uproar -- including offers by veterans to give their Arlington spots to Burlingame -- spurred two pieces of proposed legislation, including a House bill that aims to remove the age requirement for burial at Arlington. Hearings on that bill -- sponsored by Rep. Christopher H. Smith (R-N.J.) -- are scheduled before the House Armed Services Committee this morning. John C. Metzler Jr., superintendent of Arlington, attended the burial yesterday and said that under such legislation, more than 188,000 reservists and their relatives who otherwise wouldn't be eligible because they aren't old enough would immediately become eligible. Metzler said such a change would cause the cemetery, which is rapidly filling, to close its gates sooner than expected. Under current rules, the cemetery expects to run out of space in 2025. 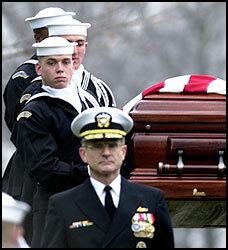 Burlingame was lowered into the ground at Arlington yesterday not far from where his parents are buried. His brother, Mark, said it was Burlingame's lifelong dream to fly jets, adding that his proudest moment was earning his gold aviator's wings in 1973. "He was the go-to guy to get the job done," Mark Burlingame said. "He was the kind of man everyone would have been proud to call a fellow American." Navy Vice Adm. Timothy Keating said Burlingame, who trained many pilots, "could make the jets talk. He could fly." Keating, a classmate of Burlingame's at the Naval Academy, said U.S. forces will avenge his death as they fight terrorism. "Those of us who were Burlingame-trained, we're going after them hard because Chic taught us how to do that," Keating said, his voice rising. "They are going to live to regret the pain they have caused us today." The pilot of the hijacked American Airlines jetliner that terrorists crashed into the Pentagon was buried yesterday with full military honors in Arlington National Cemetery, a few hundred yards from his parents' graves. 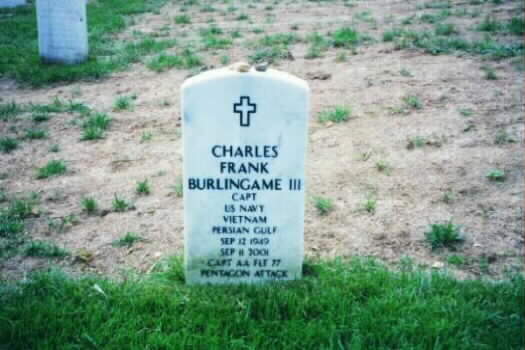 Captain Charles Frank "Chic" Burlingame III was a "true American patriot who paid the ultimate sacrifice," said U.S. Senator George F. Allen, Virginia Republican, who helped persuade military officials to allow the pilot to be buried at Arlington. Captain Burlingame was one of 189 persons killed when terrorists crashed American Airlines Flight 77 into the Pentagon on September 11 — the day before his 52nd birthday. A U.S. Naval Academy graduate, former Navy pilot and 17-year Naval Reservist, Captain Burlingame was initially denied his own grave at Arlington because he died before age 60, the eligibility age for reservists. Mr. Allen asked President Bush to grant an exemption. Army Secretary Thomas White overruled the regulations and permitted the burial. Yesterday, about 500 people — civilians and uniformed military personnel — attended his funeral in Fort Myer Memorial Chapel. Most then walked behind the horse-drawn caisson to the grave site west of the Tomb of the Unknowns. A flyover by four jets, including three flown by American Airlines pilots, was canceled because of cloudy weather. After a 21-gun salute and the playing of taps, the honor guard folded the American flag and placed it atop the wooden casket. Adm. Christopher Weaver presented it to the pilot's widow, Sheri Burlingame, an American Airlines flight attendant. 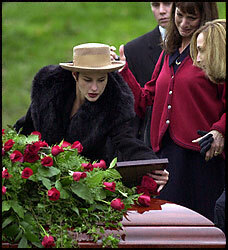 Concluding the service, Mrs. Burlingame placed a red rose over a bouquet on the casket and blew it a kiss. Then 15 other relatives added roses to the display. Some knelt and bowed their heads. "Chic was among the very first casualties of this war" against terrorists, said Captain Michael D. Marks, retired Naval Reservist and friend of Captain Burlingame. Captain Burlingame grew up in Orange County, California, and had planned to celebrate his birthday there by attending an Anaheim Angels baseball game on September 12. When he learned he could not get a good seat to the game, he told his wife not to join him aboard the ill-fated American Airlines Flight 77, according to his brother Brad. Captain Burlingame is survived by his widow; his daughter, Wendy Pattavina, and her son, Jack; his stepsons, John and Chad Harris; his brothers, Bradley M. Burlingame of Los Angeles and Dr. Mark W. Burlingame of Lancaster, Pennsylvania; his sister, Debra A. Burlingame; an aunt, Mollie Horn of Crystal, Minnesota; and an uncle, Wayne Burlingame of Roseville, Minnesota. Captain Burlingame's parents died about three years ago. Several family members walked to his parents' graves after the burial services concluded. More than 250 mourners gathered to create a sea of military and airline uniforms at Arlington National Cemetery to say goodbye to Captain Charles Burlingame. 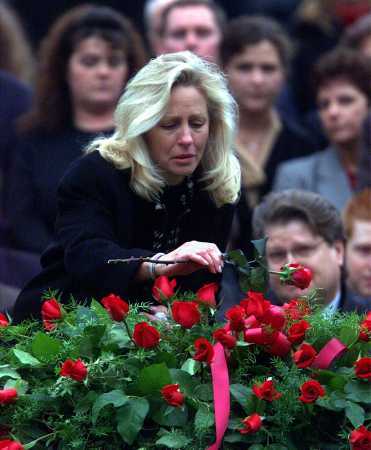 Burlingame, who piloted hijacked Flight 77 that crashed into the Pentagon, was buried after a struggle with military officials that garnered national attention. After initially denying his wife's request for his own plot, saying he was ineligible for under cemetary rules, the secretary of the Army reversed the decision. A Navy band played "America the Beautiful" as the flag draping the casket was ceremoniously folded to be presented to Burlingame's widow. At the funeral services, a naval colleague described the man they called "Chic" as outgoing, glib and gregarious. 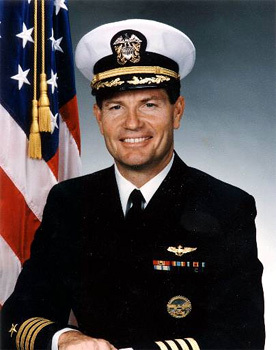 Timothy Keating, a friend of Burlingame's from the Naval Academy, described him as a gifted aviator who could bring out the best in young naval aviators he trained in Texas. Keating promised the crowd those trained by Burlingame were going after those responsible for his death. Burlingame flew fighter jets in the Navy for eight years and served in the reserves for 17. One friend called it ironic that Burlingame died while flying a commercial plane. Senator John Warner, who fought to allow Burlingame to be buried at Arlington, said evidence shows the pilot died before the crash, fighting off the terrorists. Funeral services were held Wednesday at Arlington National Cemetery for the pilot of the doomed jet that terrorists crashed into the Pentagon. Charles Frank Burlingame III was "a true American patriot who paid the ultimate sacrifice as one of our nations first warriors to perish in the war on terrorism,'' said Sen. George Allen R-Va., in prepared remarks. Burlingame, 51, a former Navy pilot and 17-year Naval reservist, was initially denied his own grave at Arlington because he died before age 60, the eligibility age for reservists. Allen asked President Bush to grant an exemption. Army officials said he was eligible to have his cremated remains placed in the cemetery's Columbarium, or share his parents' plot. Burlingame's family protested, saying his long military history and the fact that he died in the September 11 attacks should have been taken into account. Army Secretary Thomas White reversed the decision and allowed Burlingame to have his own plot. When the burial site was in doubt, veterans offered to give up their own plots, Allen said. "Americans have come to appreciate how Captain Burlingame lived his life and how he died using his last breath in the struggle against terrorism,'' he said. Burial with his parents would mean that Burlingame's widow, Sheri, could not be laid to rest beside her husband. Also, Burlingame, of Herndon, Virginia, would not have his own tombstone but would have his name placed on the back of the family plot marker. Rep. Chris Smith, R-N.J., chairman of the House Veterans' Affairs Committee, introduced legislation Thursday to eliminate the age requirement for in-ground burial. Burlingame grew up in Orange County, California, and he had planned to celebrate his birthday there by attending an Anaheim Angels baseball game on September 12. When he learned he couldn't get a good seat to the game, his brother Brad said, he told his wife not to join him aboard the ill-fated American Airlines Flight 77 that terrorists crashed into the Pentagon. Charles Frank Burlingame III, described as a gifted pilot who could "make the jets talk,'' was buried at Arlington National Cemetery Wednesday, three months after terrorists crashed his plane into the Pentagon. Burlingame, 51, a former Navy flier and 17-year Naval reservist, was initially denied his own grave at Arlington because he died before age 60, the eligibility age for reservists. Army officials said he could have his cremated remains placed in the cemetery's columbarium or share his parents' plot. Burlingame's family protested, saying his long military history and the fact that he died in the September 11 attacks should have been taken into account. Army Secretary Thomas White reversed the decision last week so the pilot could have his own grave. Vice Admiral Timothy Keating, a Naval Academy classmate, said Burlingame "was a gifted aviator. He could make the jets talk. He knew how to fly.'' Keating said in the 1960s, he helped give Burlingame a second nickname, "Gramps,'' after spotting him in a pair of red leather slippers. Whitman described his friend, who served several tours at the Navy's elite Top Gun school, as "a blend of Tom Cruise and John Belushi'' who was a patriot but also liked to play. A caisson pulled by six black horses carried Burlingame's body to the grave site, not far from where his parents are buried. Burlingame received a funeral with full Navy honors, including a military band and a rifle salute. 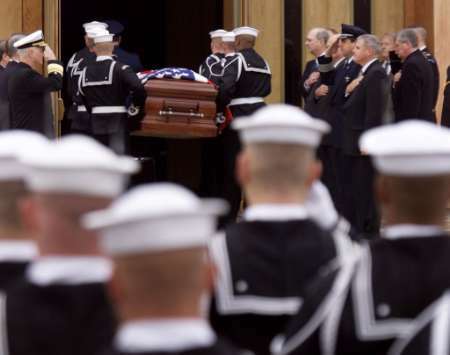 Admiral Christopher Weaver, commandant of the Naval District of Washington, presented Burlingame's widow, Sheri, with the folded American flag that had draped over her husband's coffin. Later, Mrs. Burlingame appeared to be near tears as she stared for a long moment at her husband's casket before placing a red rose atop it. Burial with his parents would have meant that Burlingame's widow could not be laid to rest beside him. Also, that would have denied Burlingame, of Herndon, Va., his own tombstone, with his name placed on the back of the family plot marker. Rep. Chris Smith, R-N.J., chairman of the House Veterans' Affairs Committee, introduced legislation Thursday to eliminate the age requirement for in-ground burial at Arlington. White said he granted a waiver for Burlingame "to honor the intent of proposed legislation, and to meet the wishes of his grieving family. "was a gifted aviator. He could make the jets talk. He knew how to fly.'' Keating said in the 1960s, he helped give Burlingame a second nickname, "Gramps,'' after spotting him in a pair of red leather slippers. Burial with his parents would have meant that Burlingame's widow could not be laid to rest beside him. Also, that would have denied Burlingame, of Herndon, Virginia, his own tombstone, with his name placed on the back of the family plot marker. The caisson holding the casket of pilot Charles F. Burlingame arrives at Arlington National Cemetery. 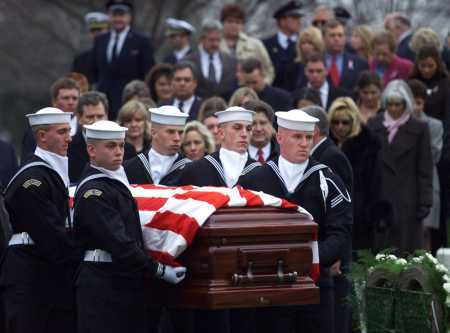 Pall bearers carry the casket of pilot Charles F. Burlingame in Arlington National Cemetery. 12, 2001 at Arlington National Cemetery in Arlington, Virginia. 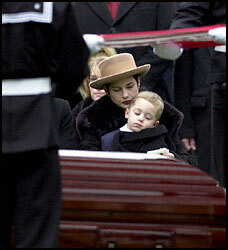 Charles F. Burlingame's daughter Wendy Pattavina holds her son, Jack, at Arlington Cemetery. Sheri Burlingame lays a rose on coffin of her husband Charles Burlingame today in Arlington Cemetery. 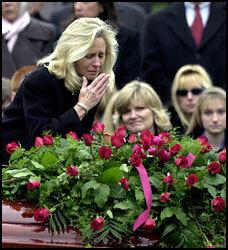 Charles F. Burlingame's daughter Wendy Pattavina over the casket of her father. The secretary of the Army yesterday telephoned the widow of Capt. Charles F. "Chic" Burlingame III, pilot of American Airlines Flight 77, to say he had reversed his stand and would let the former Navy flier be buried in his own grave at Arlington National Cemetery. Secretary Thomas E. White's announcement came after days of legislative threats, public outrage and anguished protests from relatives over the Army's refusal to depart from the rule book for Burlingame, who many believe died a hero fighting terrorists before his plane hit the Pentagon on September 11. Yesterday the Pentagon said that Burlingame would not be required to share a grave and headstone at Arlington with his parents and that his services Wednesday would include a ceremonial flyover by two Navy jets. The reversal also means Sheri Burlingame can be buried with her husband. "I'm feeling on top of the world," Burlingame said after White called her at home in Herndon. "It has been a whirlwind, and it relieves me to have it end so positively. I wish I could personally thank all of the people across the country who have helped Chic get his rightful place in Arlington." White said he changed his mind after consulting with the White House and Defense Secretary Donald H. Rumsfeld. He acknowledged that he was influenced by growing pressure from Capitol Hill, where bills had been written to force the Army to honor Burlingame, 51, with his own grave. A full burial was rejected because cemetery rules say retired reservists must turn 60 to be eligible. Burlingame had flown F-4 Phantom fighter jets for eight years in the Navy and served 17 years in the reserves. "To honor the intent of proposed legislation, and to meet the wishes of his grieving family for a December 12 funeral, I have granted a waiver allowing Captain Burlingame to be buried in Arlington National Cemetery in a separate grave," White said. "I have spoken with the Burlingame family to inform them of my decision. I also expressed my condolences for their tragic loss." The Navy flyover most likely will use EA-6B Prowlers from the Naval Air Facility Washington at Andrews Air Force Base, said Commander Tom Van Leunen, a spokesman. Administration officials said that White House Chief of Staff Andrew H. Card Jr. carefully monitored talks about the burial but that the White House did not directly intervene. "This decision was made by the Department of the Army," an administration official said. The White House issued a statement last night, saying: "The President is pleased that the Department of the Army and the family were able to work this out." Senator John W. Warner (Va.), the ranking Republican on the Armed Services Committee, helped spearhead the campaign on Burlingame's behalf, saying he was driven in part by evidence that the pilot died fighting the hijackers, not in the crash. "I felt very strongly that this was a meritorious case," he said yesterday. "The final cog in the wheel was the examination of his remains, which indicated Captain Burlingame was in a struggle and died before the crash, doing his best to save lives on the aircraft and on the ground." On Thursday, Warner and other senators proposed an amendment to the Defense Department appropriations bill that would allow burial at Arlington for all retired reservists who died in the Sept. 11 attacks. The measure, which gained bipartisan support in the Senate, was joined by a House bill that would eliminate the age requirement for burial. Those efforts were matched by a swell of support from across the country, including dozens of veterans who offered their future places at Arlington to the pilot. "This is a recognition that the events of September 11 were wartime events," said Representative Thomas M. Davis III (R-Va.). "The fatalities of that day are all heroes and deserve to be honored as such." White waived the rules for Burlingame less than a week before the pilot's scheduled funeral. Members of Congress had worried that the legislation would not pass in time for the ceremony, and some senators said it would have been a severe embarrassment for the government not to grant a waiver. Senator George Allen (R-Va.), who is scheduled to speak at the funeral, was circulating a petition among colleagues yesterday that was to go to President Bush. About 20 senators -- including Strom Thurmond (R-S.C.), John McCain (R-Ariz.), Christopher J. Dodd (D-Conn.), Ted Stevens (R-Alaska) and Barbara Boxer (D-Calif.) -- had signed before White called Burlingame's family at 3:30 p.m. yesterday. "I applaud the secretary of the Army and the president," Allen said, adding that he teared up when he spoke to Sheri Burlingame yesterday. "I'm just so glad they used their heads and their hearts in this. This is a tragedy, but the right thing was finally done." The U.S. Army agreed on Friday to allow the pilot of an American Airlines plane that hijackers crashed into the Pentagon on September 11 to be buried in his own plot at Arlington National Cemetery. Under pressure from politicians and the public, Army Secretary Thomas White said he would grant a waiver allowing Captain Charles Burlingame III to be buried in his own plot at Arlington, sacred ground for American heroes. Burlingame, a Navy pilot for eight years and a member of the Naval Reserve for 17 years, was at the controls of American Airlines Flight 77 when it was seized by hijackers who crashed it into the Pentagon. "This is a positive result in the midst of a tragedy,'' said Republican Senator George Allen, who -- along with fellow Virginia Republican Senator John Warner pushed legislation to force the Pentagon to grant Burlingame his own plot at Arlington. Military officials said Wednesday that Burlingame should be interred in his father's plot at the cemetery, but Burlingame's family refused to accept the decision. His widow, Sheri, pushed for the honor in recognition of the way he died and his military service. "To honor the intent of proposed legislation and to meet the wishes of his grieving family for a December 12 funeral, I have granted a waiver allowing Captain Burlingame to be buried in Arlington National Cemetery in a separate grave,'' White said in a statement. Allen said that he talked to Sheri Burlingame, who was thrilled with the decision. "She said 'I have a big smile on my face,''' he told reporters. Under Arlington regulations, retired reservists must turn 60 before they can be buried at Arlington National Cemetery, and Burlingame was only 52. Available space for burials at the cemetery has been dwindling in recent years. Warner, ranking Republican on the Senate Armed Services Committee and a former Secretary of the Navy, had pushed the Pentagon for a waiver for Burlingame and introduced the legislation with Allen. The measure requires a separate gravesite at Arlington for anyone who died in the September 11 attacks and otherwise would have qualified for burial there except for not reaching 60 years of age. He said he will continue to push for its passage. "There may be one or two others who meet that criteria,'' he said. The White House had urged the Pentagon to work out an agreement with the Burlingame family. "The president is pleased that the army and the family were able to work this out,'' said White House spokesman Scott McClellan, who said Chief of Staff Andrew Card had been in contact with the Pentagon for updates on the issue. White's decision means that if she chooses, Sheri Burlingame may be buried with her husband at Arlington upon her death, an Army spokesman said. Allen and Warner credited the decision to the persistence of the Burlingame family. They said the Army realized it had to act because the legislation was headed for passage and the funeral was planned for next week. "The secretary of the Army saw what was happening,'' Allen said, adding that many veterans who qualified for burial at Arlington had volunteered to give up their gravesite for Burlingame. FORT WORTH, Texas, December 7 -- American Airlines Chairman Don Carty today applauded the Department of the Army's decision to allow Capt. Charles Burlingame, captain of flight 77 on September 11 and a retired Navy Officer, to be buried in Arlington National Cemetery according to his family's wishes. Existing military regulations that determine eligibility for burial in the cemetery would not permit Captain Burlingame to be buried in a plot where his wife could later be buried with him. The regulations would only allow such a burial at age 60. Capt. Burlingame was 51 years old at the time of his tragic death. Carty said he was very pleased with the Army's decision to allow Capt. Burlingame to be buried in a place that is fitting for such a hero. The chairman of the House Veterans' Affairs Committee wants to revise rules on burial of reservists at Arlington National Cemetery, citing a dispute over the eligibility of the pilot killed in the terror attack on the Pentagon. eliminate the age requirement, now 60 or older, for retired reservists otherwise eligible for in-ground burial. Charles Frank Burlingame III, pilot of the American Airlines jet that terrorists hijacked September 11 and crashed into the Pentagon, flew Navy jets for eight years, served several tours at the Navy's elite Top Gun school and spent 17 years in the Naval Reserve. But because he was 51 at the time of his death, he did not qualify for his own grave at Arlington. His family's request for a separate grave was denied. Army officials said Wednesday that Burlingame could be buried alongside his parents, or his cremated remains could be interred in the cemetery's Columbarium, with an inscribed plaque. A service was set for December 12. 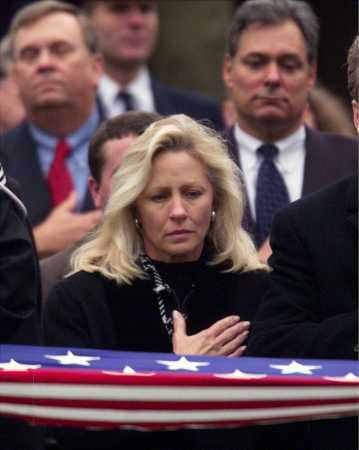 Burial with the parents would mean that Burlingame's widow, Sheri, could not be laid to rest beside her husband. Also, Burlingame would not have his own tombstone but would have his name placed on the back of the family plot marker. Burlingame's relatives are working with lawmakers to find a way around the rule so that he can be buried in his own grave. Senator George Allen, R-Va., on Wednesday asked that President Bush grant an exemption for Burlingame. Bush's chief of staff, Andrew Card, called Pentagon officials about the matter on Wednesday and again Thursday, said White House spokesman Ari Fleischer. He said Card called to "be informed about the status of the talks with the family, what the Pentagon was doing, and to be apprised of the family's reactions,'' and would continue to monitor the situation. Burlingame's sister, Debra Burlingame, said Thursday that the White House has not contacted the family. She said her brother's widow has yet to sign paperwork clearing cemetery officials to prepare a grave alongside their parents, agonized by the decision. The family of a pilot who died when hijackers crashed his American Airlines plane into the Pentagon in the September 11 attacks said on Wednesday the U.S. military is not giving the Navy reservist the burial he deserves. The family of Captain Charles Burlingame III said after 25 years of service to the Navy and his actions on September 11, the pilot earned his own plot at Arlington National Cemetery. Burlingame was at the controls of American Airlines Flight 77 that departed Dulles International Airport near Washington on September 11 and was seized by hijackers who crashed it into the Pentagon. On Wednesday, the Pentagon said Burlingame would be granted a military burial at a family plot where his father was laid to rest. The pilot's sister, Debra Burlingame, said that was a less desirable option. "They've given us absolutely zero. If my brother had died sitting on the couch in his living room, we could have buried him in the fashion that they're saying we negotiated," Burlingame said in a telephone interview. According to the cemetery's criteria, retired reservists must turn 60 before they can be buried at Arlington National Cemetery, and Burlingame was only 52. Available space for burials at the cemetery has been dwindling in recent years. "The Army has worked very hard with the family to come to an agreement where he will be buried in Arlington with his father, in the father's plot in Arlington, and they will change the headstone to reflect that," Pentagon spokeswoman Victoria Clarke said. But Debra Burlingame disputes that, saying the family had agreed to it only as one option for the pilot's widow. "We made it very clear that we didn't want this to happen. We wanted Charles to have his own gravesite and felt he'd earned it," she said. While in the Navy, Burlingame landed F-4 Phantom jet fighters on aircraft carriers for eight years and served in the Naval Reserve for 17 years. According to a report in The Washington Post, the FBI told Burlingame's widow that the pilot died of injuries sustained before the plane hit the Pentagon, indicating he was killed in a struggle. President Bush has said Burlingame and others who died in the attacks in New York and Washington were the victims of war. The burial is scheduled for December 12. 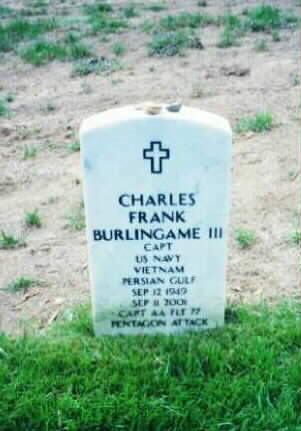 As a military man, Charles Frank Burlingame III made sure that his parents had a resting place at Arlington National Cemetery. But getting a space for him has been a struggle, even though he died in the September 11 terrorist attacks. Burlingame, 51, was the pilot aboard the American Airlines jet that terrorists hijacked and crashed into the Pentagon. He flew Navy jets for eight years, served several tours at the Navy's elite Top Gun school and spent 17 years in the Naval Reserve. He also died before age 60 -- and thus does not qualify for his own separate grave at the storied national cemetery. Army officials said Wednesday that Burlingame could be buried alongside his parents, or his cremated remains could be interred in the cemetery's Columbarium, with an inscribed plaque. Neither option pleases his family. Burial with the parents means his widow, Sheri Burlingame, cannot not be laid to rest beside her husband. It also means Burlingame's name will be placed on the back of the family plot marker. Cremation was never an option, "whether he was at Arlington or some other place," said his brother, Brad Burlingame. The family say the FBI concluded that Burlingame died of injuries sustained before the plane hit the Pentagon -- obviously a fight for his country. They want President Bush to intervene so Burlingame can, in death, receive honors that befit the way he gave his life. "My brother died in combat with terrorists," said Brad Burlingame. "His burial treatment would be no different if he had died on his couch in his living room. September 11th has played zero role in their decision." Senator George Allen, R-Va., asked Bush on Wednesday to sign a waiver allowing a burial plot for Burlingame, who lived in nearby Herndon, Virginiaa. It was a personal request made in a phone call to a top Bush aide, said Allen spokeswoman Carrie Cantrell. But the White House was trying to stay out of the dispute. Presidential spokesman Ari Fleischer said Wednesday that this, like all other space management issues at Arlington, was for the Army to sort out. 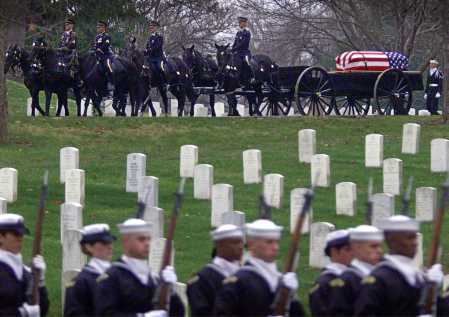 "Arlington National Cemetery is the final resting place where countless numbers of Americans want to be buried. Arlington National Cemetery is also a place that is running out of space," Fleischer said. "That's why the Department of Army is the one who is charged with this. They understand the sensitivities involved." A memorial service already was held for Burlingame at his alma mater, the U.S. Naval Academy. He is scheduled for burial at Arlington next Wednesday, said Barbara Owens, spokeswoman for the Military District of Washington, the command responsible for Arlington. Brad Burlingame said the family accepted the space in the family plot and for the moment plans to proceed, but was profoundly disappointed when officials denied a request for a military jet fly-over, a privilege usually reserved for those who die in combat. "That was a final blow for us. They can't get a plane up into the air for an American hero? Something's wrong," Brad Burlingame said. "Yes, he can be buried with our mother and father, but we think he deserves more than that." Plus, his brother said, Charles Burlingame had clearly anticipated an Arlington burial. He arranged burials for his father, retired Master Sergeant Charles Frank Burlingame Jr., who died in 1999, and his mother Patricia, who died 10 months before her son. Charles Burlingame visited his parents' graves once a month. Sometimes, he would leave pilots' wings on the family headstone, Brad Burlingame said. "He lived and breathed a military life," Brad Burlingame said. 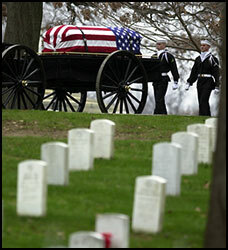 "Arlington was sacred ground for him. We're hoping to reach some closure with his funeral." Captain Charles Frank Burlingame III, "Chic," to those who knew him, was the pilot of American Airlines Flight 77. According to a family spokesman, Burlingame, 52, a resident of Oak Hills in Fairfax County, Virginia, was the husband of Sheri Burlingame and the father of Wendy Burlingame. He is also survived by two brothers, Dr. Mark W. Burlingame, of Lancaster, Pennsylvania; and Bradley M. Burlingame, of Los Angeles; and a sister, Debra A. Burlingame, of Los Angeles. He was a 1971 graduate of the U.S. Naval Academy and an honor graduate of the Navy "Top Gun" school, in Miramar, California. He flew F-4 Phantoms for the Navy and served aboard the USS Saratoga. He continued military service as a reserve officer retiring at the rank of Captain in 1996. Born in St. Paul, Minnesota, he was the oldest of four children of Mr. and Mrs. Charles Frank Burlingame Jr. His father was a World War II Navy veteran who later served as a non-commissioned officer in the Air Force. As a result, Captain Burlingame grew up on or near military bases. As a youngster he hoped to attend a service academy and become a pilot. He was an Eagle Scout and played trumpet in his high school marching band. He received a bachelor of science degree from the USNA and would have attended his 30th academy class reunion next week. His family said his airplane crashed the day before his 52nd birthday in the shadow of Arlington National Cemetery where his recently deceased parents are buried. All six crew members and 58 passengers on Flight 77 perished in the crash. Charles F. (Chic) Burlingame III was born September 12, 1949 in St. Paul, Minnesota. He and his wife Sheri have resided in Oak Hill, Virginia, for the past five years. A senior pilot at American Airlines, he began his airline career in 1979 after graduating from the Naval Academy in 1971. Chic served as a naval aviator flying F4 Phantoms and stayed in the reserves and rose to the rank of Captain. He earned the “Defense Superior Service Medal” and retired in 1996 after twenty-five years of distinguished service. Due to security, all guests names must be included on a list for the guard at the entry gate. The Naval Academy Security office must have this list no later than Tuesday, September 18th. To place your name on the list, please call 703-779-9769 speak clearly and spell your name, or mail mandjmarks@aol.com. You will be required to present a Photo ID at the gate or you will not be allowed to enter. Relatives, classmates, co-workers and friends - about 3,000 of them - crowded into the chapel at the Naval Academy yesterday for a loving and poignant tribute to Charles F. "Chic" Burlingame III, pilot of the hijacked American Airlines plane that crashed into the Pentagon on September 11, 2001. The son of a military careerist, Burlingame held the ground near the Pentagon sacred, his relatives said: His parents are buried in nearby Arlington National Cemetery. He was a Navy reservist who served at the Pentagon not far from where his plane left a gaping hole in the building. "We're coming together for a lot of reasons," said Martini, associate director of class giving for the United States Naval Academy Foundation. The Yard, as the waterfront Naval Academy campus is known, has beent ransformed since Sept. 11 into a secure base where crash barriers and guards attired in fatigues have replaced camera-clicking tourists and their cars. flight attendant, was to fly out with him for fun. But he wanted her to stay at their home in Herndon, Virginia. He wanted her to be there so they could celebrate when he returned, relatives said. erratic course may have been caused by a struggle on the plane, and others believe he was not at the controls by the time it crashed. "He wore these really snazzy red slippers and always played the part,"Martini recalled. After graduation, Burlingame flew F-4 Phantoms out of Oceana and Norfolk, Virginia. 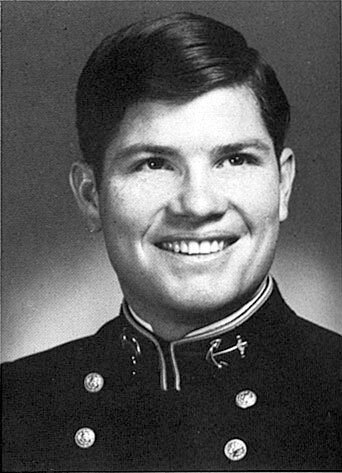 He completed his commitment to the Navy and resigned in 1979, according to an alumni directory. LOS ANGELES, September 13 - The pilot of American Flight 77 that crashed into the Pentagon Tuesday was an Anaheim native who would have turned 52 Tuesday, a local station reported. Charles "Chick" Burlingame III "grew up right here in Southern California, graduating from Anaheim High School," his brother Bruce told Channel 9. "He was a long-time Angels fan and he loved the Lakers. "Today was his birthday," he said, choking back tears. "He would have been 52. He was a beloved son, father, husband, brother and friend." Sister Debra Burlingame said the U.S. Naval Academy graduate would have had his passengers' best interest in mind. judgment. He was aware that when he went to work there was always a possibility of some kind of catastrophe, but it was very, very remote. I don't think that when Chick went to work he thought about hijacking." Burlingame planned to celebrate his birthday in Southern California, his brother said. "But he couldn't get good enough seats for the Angels game," so he told his wife in Virginia to stay home and they'd celebrate when he returned. Burlingame is survived by his wife and daughter. He is expected to buried in Arlington National Cemetery alongside his parents, Channel 9 reported. He had eluded death before, in his eight years flying F-4 Phantom jet fighters for the Navy and 17 years in the cockpit for American Airlines. The experiences of landing crippled fighters and just missing ill-fated flights never let the Fairfax County resident forget the dangers of flying or neglect the skills that had always brought him home. So for those who knew Captain Charles Frank Burlingame III, news that terrorists had wrested control of his aircraft and plunged Flight 77 like a guided missile into the Pentagon conjured unbearable images of the last moments of his life -- and those of his passengers. "He always had the answers, and he always would solve the problems, but this one was bigger than him," said Mark Burlingame, who said his older brother was intensely serious about his responsibilities as a commercial pilot. "I don't know what happened in that cockpit, but I'm sure that they would have had to incapacitate him or kill him because he would have done anything to prevent the kind of tragedy that befell that airplane." In the days since Tuesday's attack, Burlingame family members, like relatives of all those on the Boeing 757, have waited for some word from investigators about what might have happened during its terrifying hour in the air. What might their brother have done to thwart the terrorists' plans and save his 58 passengers and five crew members? The only hint of their final moments has come from two brief phone calls that passenger Barbara Olson placed to her husband, Solicitor General Theodore Olson, as the plane was heading toward Washington. And so the captain's siblings, perhaps feeling a special responsibility to reach out to other families, spoke out yesterday, offering consolation and explanation of the measure of their brother's mettle. "If he couldn't save that plane, nobody could," said Burlingame's younger sister, Debra, a lawyer who lives in Los Angeles. "We want to tell his story so that people who had loved ones on that flight will know that he would have sacrificed himself to save them." With body bags waiting on the Pentagon grounds, rescue workers continued the painstaking task of removing victims' remains from the smoldering building, and military officials announced that the death toll had risen to nearly 200. "One of the true ironies of this crash is that it was into the Pentagon, where he worked for many years as a naval reserve officer," said Burlingame's brother, Brad, a tourism executive in West Hollywood, California. "The people that perished in that crash could very well have been friends and colleagues of his." Charles Burlingame, an aeronautical engineer and honors graduate from the Navy's Top Gun fighter pilo school in Miramar, California, had been known since he was a child as "Chic." He earned the nickname "Gramps" from his classmates at the U.S. Naval Academy because of his penchant for wearing snazzy red slippers as a midshipman. His style, his Hollywood good looks and his appreciation for R&B music belied a serious side -- a life-long love of aviation and a discipline honed at the military academy and eight subsequent years of service in the Navy. In recent months, Burlingame had been helping to organize the 30th reunion of the Class of '71, making appearances at local schools to recruit students for the Naval Academy and raising funds for his alma mater. On Wednesday, he would have turned 52. His wife, Shari, a flight attendant for American Airlines, had planned a special dinner in anticipation of his return flight from Los Angeles, relatives said. News of his death drew outpourings from classmates around the world. "I'm sure Chic was fighting bravely to the end," one wrote to Shari Burlingame, who remained secluded in the couple's Herndon home. Mark Burlingame, a cardiologist in Lancaster, Pennsylvania, recalls his brother saying that in a plane crash, "whatever happens to my aircraft, I know that I'm going to suffer the same fate. The pilot rarely survives." Like many military pilots, Burlingame considered the most difficult job to be landing an F-4 fighter jet on the deck of an aircraft carrier as it pitched at sea in the dark of night. Once, his brothers recalled, he put down a jet without landing gear. No one was injured. After he left the Navy, Burlingame was hired by American Airlines in 1989. For a time, he flew regular routes to South America. But he gave them up in order to spend more time at home. A month later, one of the pilots who replaced him crashed into the Colombia mountainside. "He knew there was danger there," said Mark Burlingame. "He avoided disaster." Friends and family remembered him as a man who was unabashedly patriotic, who embraced military life even after he retired from active and reserve duty. He remained active in the reserve, working until 1996 as a liaison in the Pentagon. When his plane went down Tuesday, it ripped through a section of the building that includes the Navy Reserve offices. His siblings, who watched Burlingame step in to lead the family after their father and then their mother died, are hoping that he may be laid to rest near them, in Arlington National Cemetery. "That was a sacred place to him," Mark Burlingame said, his voice breaking. "We think he would have wanted it that way."